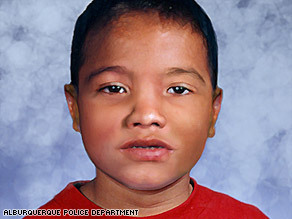 Nobody knows name of boy dubbed "Baby Justice" or "Baby Angel"
(CNN) -- Police in Albuquerque, New Mexico, released a composite image Tuesday of a young boy found buried beneath the sand of a local playground. Police released this composite sketch of the boy in hopes that someone can identify him. The boy was discovered on Friday by a passerby who saw a tiny black and lime shoe protruding from beneath the playground sand. It led police to the body of a boy, who had been buried there in a shallow grave less than 48 hours earlier. On Tuesday, police still had no answers as to what happened at Alvarado Park -- or even who the boy was. His name is unknown, though the community has dubbed him "Baby Justice" or "Baby Angel." Nobody in the area has claimed his body, and nobody has reported a child of his age missing. Before the composite image was created, police weren't able to release a photo of the boy because his body was so disfigured by the sand's heat. Police say the Native American or Hispanic boy was between 3 and 5 years old, 38 pounds, 38 inches in height, with brown eyes and dark quarter-inch hair. When he was found, he was wearing Arizona brand clothing, size 3T -- nylon black running pants with red stripes, a red shirt with a monster truck on it and black, gray and lime green Skechers sneakers. Police aren't sure how he died. Albuquerque Police Department spokesman John Walsh said a preliminary autopsy didn't reveal a cause of death. Walsh said there were no obvious signs of bruising on the boy. "We have canvassed the entire adjoining neighborhood," Walsh said. "We're knocking on every door. We've been broadcasting and pleading for tips from the community. But still, nobody has come forward." Though police have received numerous tips from the public, Walsh said nothing has come from them. Albuquerque police are working with other local, state and nationwide law enforcement officials to try to piece together what happened. Until then, members of the community have spent hours at memorials for the boy -- who none of them knew -- praying for him and raising money. French Mortuary, in the town, has offered to pay all funeral costs for the boy. Resident Rachel Lesperance told CNN affiliate KOAT-TV she spent her weekend collecting $3,600 for the boy. Her money, and the donations raised by others, will go toward a plaque at the park in the boy's honor, buying extra lights for the playground and to a fund toward finding out what happened to the little "Baby Justice." "He doesn't have a family," Lesperance told KOAT-TV. "We're his family now, and we want him to be taken care of like one of our own."